Seamus and his twin brother, Archer, love video games in different ways. Archer loves to watch them on YouTube. Not just Lets’s Plays, but commentary-free compilations of classic titles. Seamus loves to learn about video game history. He’s a big fan of Did You Know Gaming and the Game Historian on YouTube. Seamus also likes to play games. Just not with me, until now. Part of the reason we haven’t played together is Seamus’ usual games of choice. He likes sports games. All sports games. Not just the big name stuff like FIFA, Madden and the NBA2K series, but obscure stuff like the official game of the Australian Football League, AFL Evolution. It’s a bad game about a bad sport, but he loves it. The other big reason we’ve not played together is that he’s flat-out refused. Most of the time when I ask him if I can play with him, he hands me the controller and leaves. “No wait, I want to play two-player!” I shout at his retreating back. “No, you play,” he replies as he wanders off to play on his computer in his bedroom. I once tried to join in as player two while he was playing Injustice 2, a perfectly normal game for a seven-year-old to be playing, and he literally ran away. Then came Pokémon Let’s Go! Eevee. It’s a remake of a game I’d normally play solo. I had no plans to fool around with the game’s two-player functionality, in which a second trainer can pop in and out of the game by shaking a second Joy-Con controller. Seamus just happened to be in my office when I docked my Switch, accidentally activating player two when I slid the controllers from their mount. The backup trainer shows up wearing whatever outfit the main character is wearing. We wandered around ghostly Lavender Town, making stupid jokes together to defuse the creepy vibe. “I love the smell of incense,” said one non-player character. “More like nonsense,” replied Seamus, who unfortunately inherited my love of wordplay and puns. We almost didn’t hear his mother calling for Seamus to come to bed. But Seamus’ mother is loud, and as heartwarming a moment as it was, it came to an end. 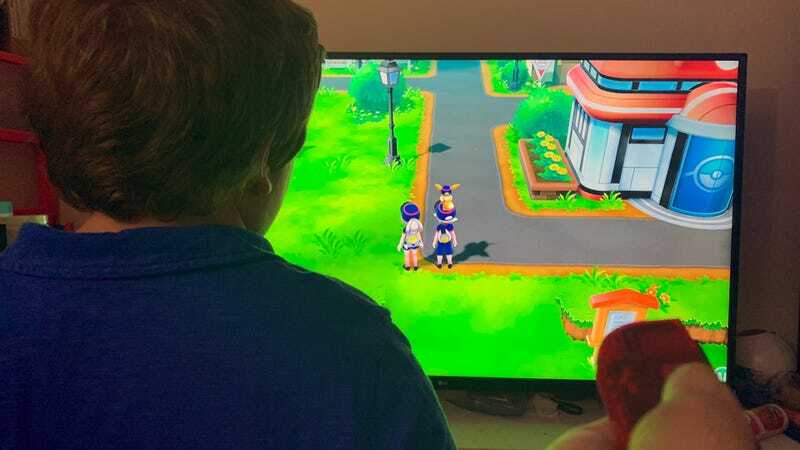 “Dad, can we play Pokémon together?” Seamus surprised me with this question the next day after school. I figured he would have forgotten or moved on to something else, maybe gone back to playing that godawful AFL game. But no, he wanted to play with me. So we played. Battling in two-player mode gives each player control of one of the Pokémon in the main character’s party. It’s not really fair for the computer-controlled enemy trainers. Getting your Dodrio double-teamed by a father and son Eevee/Kabutops duo can’t be fun for them. It was a great deal of fun for us. Me, sitting in my wheelchair, Seamus standing beside me, hopping with excitement. “Look, he’s taken out Pigeot!” he cried. “More like idiot!” Okay, maybe his jokes are one-note, but he’s only seven. He’ll get there. Seamus, not being familiar with Pokémon strengths and weaknesses, relied on me to help him choose which attacks to use. He’s a big fan of Eevee’s bite and double-slap moves. Not so much double-edge, which hits Eevee with recoil damage when used. He doesn’t like seeing our team get hurt. He savagely loves seeing the opposing team fall. Since he was using the right Joy-Con, Seamus was in charge of screenshots. He did his best. But Seamus isn’t just a battle partner, he’s a Pokémon catching partner as well. When hunting wild pocket monsters in two-player mode, both players can throw pokéballs at their prey. Should they hit their target in unison, an animation plays of the balls combining into one, becoming stronger. Seamus and I call the move “doubling up,” and it’s a cause for raucous cheering and high fives. Beware the wrath of our two balls. Shut up. We’re a team, in a way I’ve always wanted us to be. Most of the time I’m taking care of my business and he’s taking care of his, but when it comes to catching Pokémon, we’re in this together. With Seamus and his brother both on the Autism spectrum, it’s rare when we can connect like this. Their minds work beautifully different than mine, and we’re rarely on the same page. It might sound corny, but this is the most dad I’ve ever felt. I’ve already beaten Pokémon Let’s Go! Eevee. Right now I’m just wandering through Kanto, picking off any trainers and critters I missed the first time through. But I might just have to erase my save and start over again. Maybe I’ll let Seamus be player one this time.